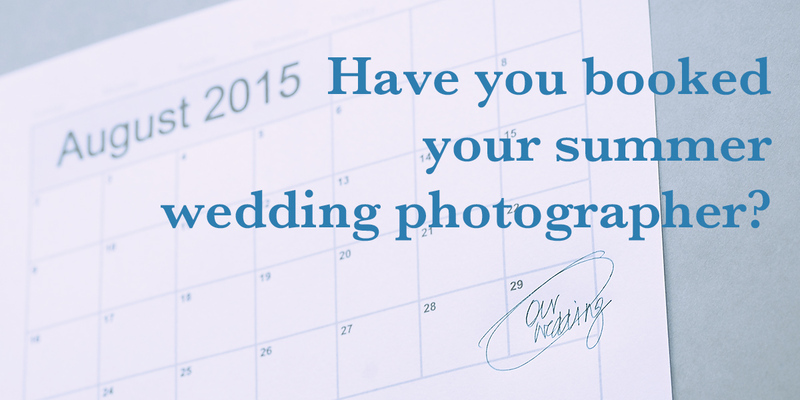 Have you booked your summer wedding photographer? If you’re getting married this summer and thinking of hiring a professional wedding photographer, are they booked yet? If not, better get your skates on as you could be out of luck on some peak dates. Twice in the past week, couples have got in touch about hiring a professional wedding photographer for Saturdays in July and August. I haven’t been able to help and so have asked colleagues for availability. In one case, even when asking a group of more than 40 photographers, not one was available. Not one. For the other date, there were two available. So if you are getting married any Friday or weekend between now and the end of September in the UK, please book your photographer as soon as you can. If you don’t, you may end up with either no photographer or no choice. If it is one of your friends who is getting married, please check with them to make sure they have their photographer booked. The especially busy dates I have found so far for London are July 25, August 29 and September 5. I have been a London wedding photographer for almost 15 years and this is the first time in the past 10 where unavailability has been so pronounced. For those couples getting in touch for busy dates, I am more than happy to check availability with colleagues and email you their details where available.